You've been calling for a new approach, "hedonistic sustainability," which is "sustainability that improves the quality of life and human enjoyment." What are some examples of this? Why is it important for sustainability to enhance pleasure? We shouldn't forget what we are here to do in the first place as architects and landscape architects. It's to improve the quality of life for everyone and not at the expense of the quality of life for other people or other life forms, for that matter. The whole discussion about sustainability isn't popular because it's always presented as a downgrade. The position has been there's a limit to how good a time we can have. We have to downgrade our current lifestyle to achieve something that is sustainable. That makes it essentially undesirable. People can be to the left and maybe shop a little bit green, but they're not going to drop their car if they have to pick up their kids from football and go to the movies. It becomes an impossible mission. However, there's nothing in our lifestyle that necessarily requires CO2 emissions. It's just an unforeseen side effect of all of the increases in quality of life that we have been able to deliver through modernization and industrialization. As we get smarter and more aware of these side effects, we can factor them in and start delivering urban mobility without emissions by switching to fuel cells or batteries. My two favorite examples from Copenhagen: 37 percent of the Copenhageners today commute by bicycle so they are never stuck in a traffic jam. You know how unenjoyable it is to sit stuck in traffic, especially if you do it every day. So 37 percent of the Copenhageners never experience that because they have the convenience of going from A to B on a bicycle. Also, our port has become so clean you can swim in it. You don't have to commute to the Hamptons to have clean water. You can actually jump in the port downtown. So these are basic examples where sustainability actually starts becoming an upgrade rather than a downgrade. In your large-scale master plan and park projects, you often feature landscape loops. For example, in your Stockholmsporten project, "a continuous bike and pedestrian path reconnects different areas in an un-hierarchical and democratic way." In Clover Block, there's a perimeter loop surrounding a massive lawn. In another project still in the idea phase, you propose a loop city in the Copenhagen suburbs. What's the attraction to these loop forms? How well do they work? They have to do with connectivity. You can see it in the loop city idea. The old paradigm for Copenhagen a city was the five finger plan, where from the central orientation of downtown Copenhagen you have these corridors of urban tissue that extend, leaving gaps between the fingers of green and agriculture. But, of course, this is a hierarchical and central model where the further you get out in the finger, the further you are away from the concentration of connectivity and activity. Given a lot of the Copenhageners live out in the fingers, and a lot people actually work in this finger and live in this finger and play football in this finger, another kind of connectivity starts becoming interesting. Since Copenhagen is actually the other side of the Oresund by Malmö and Lund and Elsinore, you have a whole suburbia over there. Historically, because it's on the Swedish side (ten years ago, we didn't have the bridge between Copenhagen and Malmö), there's never been any kind of central planning authority considering these Swedish/Copenhagen suburbs as part of the metropolitan area of Copenhagen because they're in another country. They're eight hours away from Stockholm but only 30 minutes away from Copenhagen. So what we are proposing with the loop city is to create a bi-national continuous urban tissue where people are no longer condemned to live in the outskirts and commuting into downtown Copenhagen and back out again. There will be a continuous ability to interact between these kind of urban areas that now house the majority of the population of the area. You have 500,000 people living in Copenhagen inner city and you have three and a half million people in the region. You are well known for integrating building and landscape in your large-scale residential projects. In The Mountain, terraced apartments are arranged so each gets sunlight and has its own individual garden. 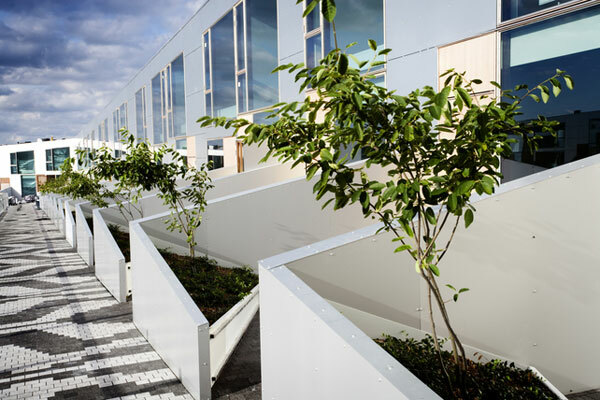 Other projects, including you upcoming West 57th Street residential complex in New York City, Vilhelmsro School, and the 8HOUSE project in Copenhagen beautifully combine building and landscape in the form of green roofs. What comes first: the building or landscape? How do they mesh? How do you deal with the different disciplines within your firm? Is it architecture versus landscape architecture? As you mentioned, it is often hard to distinguish where one discipline begins and another one ends. We've had lots of collaborations with landscape architects. We've been working a lot with Topotek 1 and Man Made Land and recently Martha Schwartz Partners and !Melk. It's an interplay. In the case of the 8HOUSE, we wanted to include the typology of the townhouse with the small garden and all of the social interaction that happens when people have a little piece of their private life happening in the semi-open, like the porch in an American suburban setting. Sitting out on the porch, you can holler at the neighbors and see who's home and who's not. You're at home and sort of semi-private but people can actually access you and there's the possibility of spontaneous interaction. We simply tried to introduce that social typology found in a dense urban block by simply allowing it to invade the three-dimensional space of the open block. To really make it townhouses with gardens, we wanted to make sure that there were trees and plants. To recreate the social possibilities, we had to include the element of landscape. In the West 57th project, the entire architecture is created as the framework for the courtyard. Somebody called it a Bonsai Central Park. It's probably 1/500 the size of Central Park but by insisting on creating an urban oasis for the residents, the whole volume of the block, the whole architecture was dramatically reconfigured and we can no longer rely on the traditional boxy typology. We created this highly asymmetrical roofscape that allows in daylight and creates views into a sort of oasis. It was really the Central Park of the Copenhagen courtyard. We arrived at a completely different architecture because of Central Park. Your upcoming project in Umeå, Sweden, the Umedalen Sculpture Park, seems to take these ideas even further, fully integrating the building into the landscape and using the landscape to guide the shape of the buildings. What were the challenges with this approach? When does this approach work or not? In this case, the brief was that there was an existing man-made valley. It was an excavation site where they had dug out the sand for the construction nearby. They were just trying to fit in a hockey rink and they didn't want some big, fat hockey rink that would ruin the whole neighborhood. It essentially became a vanishing act trying to put in a really big sports hall without dominating the area. We also tapped into the tradition of the place, where they have made summer spectacles in the ditch because it is almost like a little mini amphitheater. In that case, it was about recognizing and emphasizing the existing activities of this mini valley and just adding a cover to give it an indoor and all-year component. In many ways, I think it has to do with discovering, reinterpreting, and reemphasizing the qualities, attributes, and potential already there and just taking them one step further. In Copenhagen, you are designing a smart example of multi-use infrastructure, a 100-meter tall waste-to-energy plant that will double as a ski slope and civic center. What did Copenhagen figure out that other cities haven't? Why aren't more cities designing and building imaginative public works projects that solve multiple problems at once? Lastly, what advice do you have for other designers who are trying to get these types of innovative solutions through bureaucracies? I am seeing tendencies. We are quite interested in this new genre of projects that we call social infrastructure. A major part of any city's annual construction budget goes into improving highly utilitarian structures that are purely in the domain of civil engineering. The holistic, integral thinking that architecture and landscape architecture can contribute, where it's not technology-driven but actually human-centered, can be transformative. Instead of getting your nasty highway overpasses that create shaded areas for dodgy activities, you start incorporating social attributes and making sure that when a necessary piece of infrastructure like a train connection, a bus line, a roadway, a power cable, is carried through that it's done in such a way that it actually increases connectivity and creates new activities, so that the sheltered spaces become sort of sports facilities or market halls. There are tons of examples where decommissioned infrastructure turns into new programs. In Paris, Berlin, or London, you have galleries and marketplaces occupying the archways under the train lines. You have the High Line in New York. You have tons of examples where, after the fact, we can re-imagine the infrastructure. But what if we, from day one, can actually turn the power plant into a public park? The power plant has a budget of $700 million USD so the configuration of the roofscape is nothing compared to the overall budget. As a result, people don't feel that we're dumping a big boxy factory that blocks their views and casts shadows into their neighborhood. They feel that we're actually creating a public amenity. Normally we would get not-in-my-back-yard (NIMBY) letters and complaints about the project. Now, we're actually getting letters from people asking when it's going to open. So it's also a way of integrating the necessary infrastructure into our urban fabric rather than sort of putting it in some kind of industrial wasteland in the periphery of our city. I saw you discussing your buildings in the context of parkour in the film My Playground. Do you think through how your buildings and spaces could be reappropriated? What are the most unexpected uses of your buildings, uses you didn't imagine? We do try to wedge in as much potential and possibility into our work. The driving force of our design is to saturate it with possibility. We like the whole notion of parkour. What architects do is put potential out there and what parkour people do is to expand the preconceived or pre-planned possible use and take it one step further, essentially to expand the human realm of the city. That said, take a project like the 8HOUSE, where we made this mountain path that allows people to walk and bicycle all the way to the tenth floor for the residents. Sociological studies from the '70s indicate that children living higher than the third floor rarely come down and play because of the disconnect whereas, here, if you were living on the tenth floor, you could actually just walk four houses down and play with your neighbor to create this spontaneous social interaction. That's also why the 8HOUSE is actually a loop. Everybody's connected to everybody. Because Copenhagen is completely flat, there is no landscape, there is no vista where you can go and enjoy the view and hold your girlfriend's hand, blah, blah, and enjoy the beautiful scene except now, at 8HOUSE, there actually is. So what we didn't imagine is people from around Copenhagen actually go to 8HOUSE on weekends for a walk because this is the only place you can actually enjoy the view of the city and get this sort of three-dimensional experience that you get in a lot of other cities naturally. That means the café in the southwest corner of the 8HOUSE where the two roofscapes dive down has actually become a busier business than originally anticipated. You told Metropolis magazine that one of your goals is to put architecture on the public school curriculum, "given nobody has thought of giving students a basic understanding of how our cities have evolved." What about the other disciplines and forces shaping cities: landscape architecture, urban planning, climate, and ecological sciences? How must they be taught in schools? I see them all as part of the same curriculum in that sense. Holistic design awareness. We've actually had a little revolution or evolution in Denmark. We recently had elections and we got a very photogenic female left-wing prime minister and we have an incredible cultural minister. Five or six years ago, I was on the cultural ministry's educational council. Architecture, art, design, and planning are all under the cultural ministry rather than the ministry of education. My first proposal to the cultural minister was to give them back to education so that the whole range of architecture, including landscape architecture, is seen as an investment in the future rather than a form of high-brow entertainment. This can really ensure these subjects are seen with the seriousness of education, instead of just as a luxury, like culture is sometimes peceived. Now they're actually proposing to do it and it's causing a lot of debate in Denmark. I really believe it's the right thing to do. I wouldn't be surprised if architecture and design is not part of the public curriculum in Denmark in the next five years. Bjarke Ingels is founding partner of Bjarke Ingels Group (BIG). Ingels, who rated as one of the 100 most creative people in business by Fast Company, is also a visiting professor at Harvard University Graduate School of Design.